Vancomycin is an antibiotic of last resort usually used to treat drug-resistant infections. Vancomycin was first isolated from Bornean soil samples more than 50 years ago. Initially, few clinicians used vancomycin instead preferring other antibiotics which were considered more effective (vancomycin takes longer to act than penicillins) and less toxic. However, beginning in the early 1980s, physicians and other health-care professionals started to express renewed interest in this drug. This renewed interest was due both to vancomycin's ability to fight methicillin-resistant Staphylococcus aureus (MRSA) and ability to treat pseudomembranous colitis. Pseudomembranous colitis is a nasty infection of the colon (diarrhea) which takes hold after treatment with other antibiotics that kill of normal bowel flora. Vancomycin is a tricyclic glycopeptide. It binds to bacteria cell walls and alters cell membrane permeability. It also interferes with bacteria RNA synthesis. When fighting most gram-positive organisms like staphylococci and streptococci, vancomycin's actions are bacteriocidal. In other words, vancomycin works to directly kill the gram-positive bacteria. However, when fighting enterococci, another type of gram-positive organism, vancomycin's actions are bacteriostatic, and it works to inhibit bacteria reproduction. Because vancomycin is poorly absorbed by the gastrointestinal tract, it is usually administered as an injection. However, when used to treat enterocolitis and pseudomembranous colitis, both infections of the gastrointestinal, patients take oral vancomycin. Vancomycin is usually administered in an inpatient (hospital) setting. Because dosing is complicated and depends on peak and trough concentrations, inpatient pharmacists are usually called on to calculate dosages. Furthermore, because vancomycin is excreted by the kidneys, dosing of this drug is more complicated in people with renal failure. 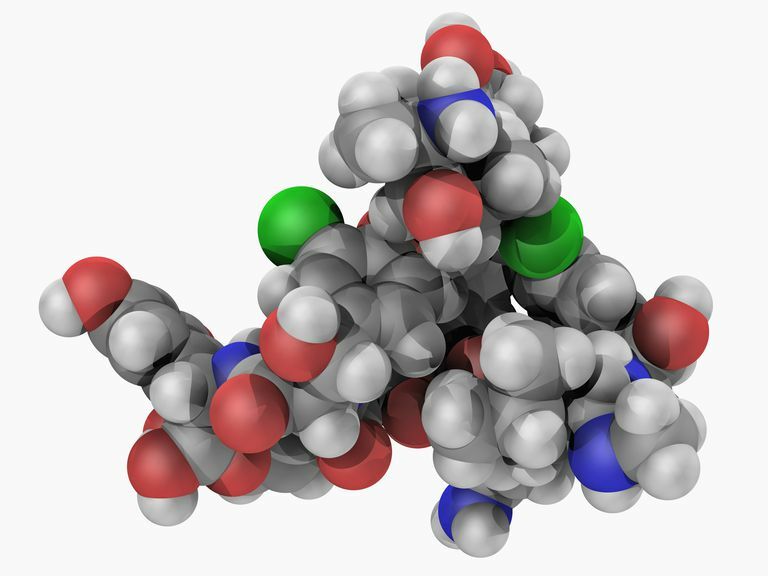 Serious detrimental side effects attributable to vancomycin are rare, and vancomycin's most common adverse effect is a limited hypersensitivity or allergic reaction. However, vancomycin can be nephrotoxic and damage the kidneys especially when administered with aminoglycosides, another type of antibiotic. Moreover, when administered with aminoglycosides or high-dose intravenous erythromycin, also another type of antibiotic, vancomycin can damage hearing (ototoxicity). Finally, vancomycin can cause hyperemia or red-man syndrome, a type of flushing; such flushing can be mitigated if the patient is first given antihistamines. Vancomycin resistance poses a growing concern among clinicians, researchers and epidemiologists alike. Because vancomycin is one of our last lines of defense against dangerous and drug-resistant disease, the prospect that it will no longer work to combat infection is undeniably frightful and leaves us with few other options (think Zosyn and ceftaroline). Specifically, strains of vancomycin resistant enterococci have cropped up in hospitals worldwide. Because vancomycin is usually administered in hospitals, skilled-nursing facilities (SKFs), nursing homes and so forth, it's imperative that health care professionals take steps to limit vancomycin resistance such as curbing overprescription and limiting the spread of vancomycin resistance among patients through proper patient isolation and hygiene practices. Guglielmo B. Anti-Infective Chemotherapeutic & Antibiotic Agents. In: Papadakis MA, McPhee SJ, Rabow MW. eds. Current Medical Diagnosis & Treatment 2015. New York, NY: McGraw-Hill; 2014. Accessed April 07, 2015. Mosby's Drug Reference for Health Professions, Second Edition published by Mosby/Elsevier in 2010.